Some people travel for the architecture, the museums, the history. I travel for the food. Don’t get me wrong – I’m all about new cultural experiences and exploring a country’s natural beauty, but when it comes to planning an itinerary, I follow my stomach. This means several breaks for meals. Even when consulting my Lonely Planet for things to do, I’m governed by my gut. I plan my walking tours around recommended eateries. I read about restaurants on the plane. I want to sample all the national cuisine, no matter how bizarre. I want to eat all the things. 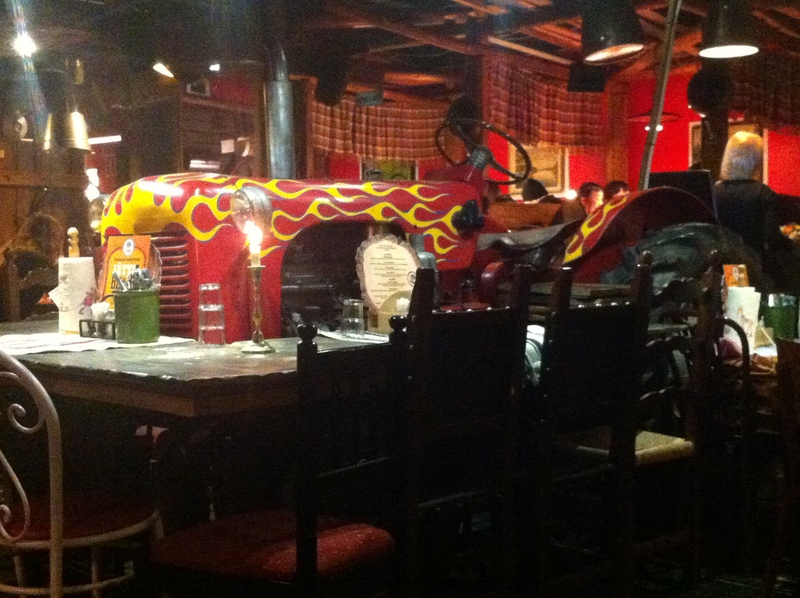 I’d located five dinner venues in the surrounding area that were a decent walk from our hotel until I found Zetor. 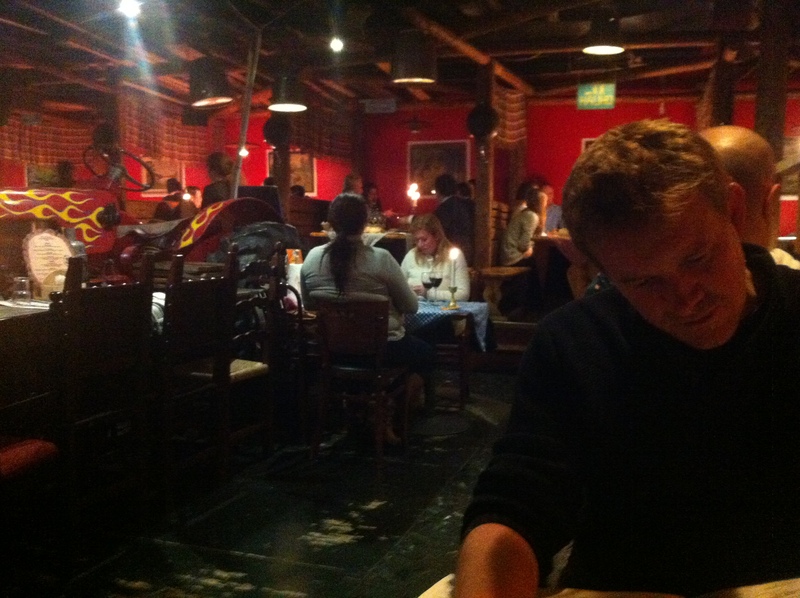 Zetor was filed under drinking and nightlife, but Lonely Planet said that it served reasonably-priced Finnish dishes. Better, it was located in the same map grid as our hotel, so we were sold. We braved the brisk wind and strolled past the train station to what looked like a strip mall. It took us a while to locate Zetor, but when we did, we were greeted by a warm, spacious and tractor-filled interior that compensated for the strip mall exterior. It was well after 6, so we were asked to pay 2,70 euro each to check our coats. It was evident then that Finland would not be cheap. 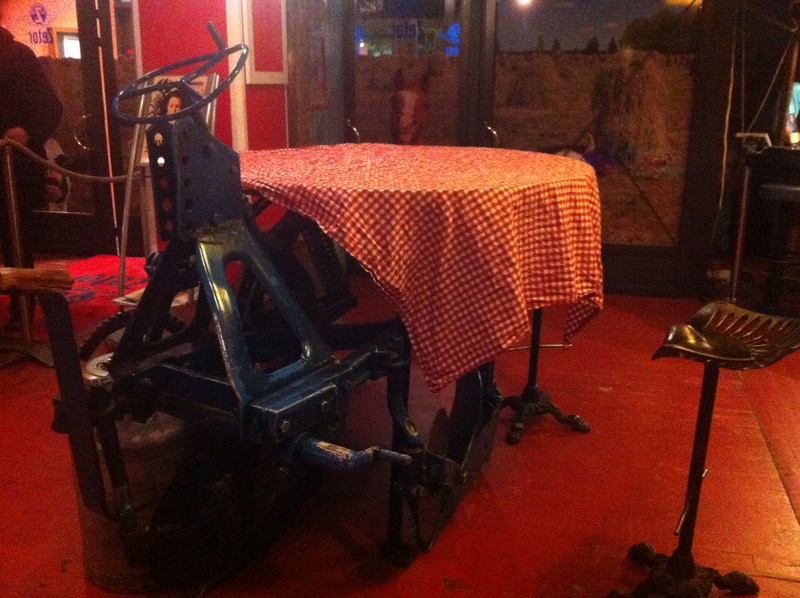 We were seated at a small table covered in a red and white checked cloth, just beside a larger Hibachi-style table, except instead of encircling a dexterous Japanese chef, it orbited a large red and yellow tractor. At 5,60 euro, Koff III was the cheapest beer on the menu, so we ordered two. Only then did I notice the equally cheap berry wine options – at 21% alcohol, Finland’s berry wines are both potent and diverse. If you are a berry-lover, Finland is the place for you. Not only does Finland offer traditional berries like blueberry and cranberry, it also specializes in esoteric, intriguing berries like cloudberries, bearberries, lingonberries, and the whimsically named whortleberries and hardy sea buckthorn. Willy Wonka would have had a conniption here. 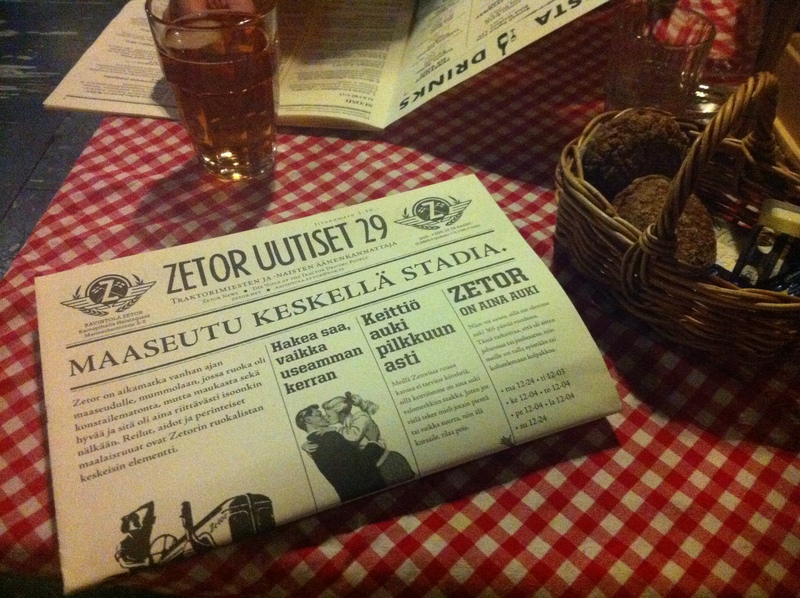 Zetor did not disappoint: its quirky newspaper-formatted menu offered too many mysterious and delicious options, from blinis to reindeer, prepared every way you can imagine and probably in ways you can’t. The emphasis on reindeer, I read, is in accordance with the restaurant’s theme of a simpler time in the Finnish countryside. Jamie opted for sautéed reindeer while I ordered an open face reindeer sandwich for 12,70 euro. Trust me when I say that you get your money’s worth: it comes piled with smoked reindeer mousse, reindeer bacon, pickles, and lingonberries. I’ve never tasted anything quite like it, from the unique marriage of texture – creamy mousse, crunchy pickles, crispy bacon – to the flavor combinations that ignite every taste bud: sour pickles, sweet berries, juicy meat. Washed down with a cold brew, it was a hearty meal that effortlessly won my heart over to Finnish food. We would’ve hung around to ride the tractors and empty our wallets at the bar when it livened up with line dancing, but we had a plane to catch unfairly early the next morning. How unusual to have the tractor inside.